Still Using 12 years later! These fleece bags are great! We have had them for 12 years. My kids are now in college and still using them. We finally need more beans. Five years ago my brother gave me a used bean bag chair as a dog bed, and my dog loved it so much I bought a second one for her. Both are still going strong, The fleece is soft but incredibly tough--still using then original covers and liners. Getting ready to order more bean bag chairs! I ordered two of your bean bag chairs for my grand kids last Christmas and they LOVED them! Then several months ago, I ordered two more for my house. Grand kids have them on their Christmas list again this year too! They are so sturdy and good quality. Really love them. We have 2 of the 37" with fleece covers. Absolutely love them and have recommended to friends and family. We absolutely love these beanbags. They are comfortable and I love that you can remove the cover for washing. Our 6 year old slept on his the first night he got it! Company was extremely helpful and accommodating when we were trying to get these delivered for a certain date and an absolute pleasure to deal with. THE best bean bag chairs around! We have two of these fleece covers and put them through the rigors of children and pets for two years now. Pet hair, spills, dirt? No problem, unzip and throw into the wash and it will be clean in no time! We like the warm fleece especially in the winter in the northeast - a nice warm hug of a chair. I have even found my husband asleep across both of them before!! You will not regret buying these. Bought a large bag several years ago for the kids and it is still in great shape! My only regret is that I don't have room for more than one bean bag chair. We purchased the fleece bag a few years ago for our son, and it has held up amazingly well, despite everything that he, his sister, and friends have put it through. It still looks great, is durable, and is the first place anyone sits in our rec room. Ordered 2 for my grandsons...instant hit! We have two and will be ordering a third!! We have had a pink and a purple of the 37 inch fleece bean bags for about 4 years now. Our daughters use them every day and we get asked all the time where we got them! They have held up extremely well so far. I wash the covers at least once a month and have not noticed any fading at all. I will be ordering a new one for our third daughter in lime. Highly recommend!! I could be your spokesperson! We just love our beanbags. We have gotten them for all of our grandkids around the country. You know how boys are, our grandson trashes furniture and your beanbag has lasted since 2007. People ask us all the time where we got it because it lasts and lasts. It is better than the Boppy for the little ones. Thank you! Hi. I just wanted to let you know I received my bean bag chair via fedex today. Thank you!! It's a very bright yellow just like Spongebob so my son will be happy. I received your bean bags and I am pleased! I'd like to order 2 more and a cover. Thanks. 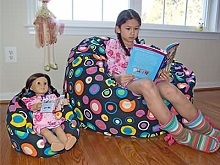 I ordered two 37" bean bags for my kids almost 5 years ago and they love them! It's amazing how well they hold up over the years. In fact, I just ordered another one for my daughter, who has moved into off campus housing, as a housewarming gift. I have recommended your bean bags to friends and family.